An effigy mound is a raised pile of earth built in the shape of a stylized animal, symbol, human, or other figure and generally containing one or more human burials. Effigy mounds were primarily built during the Late Woodland Period (350-1300 CE). I originally became aware of effigy, or stylized burial mounds, to include the Serpent Mound and other mounds, as a young child in school. 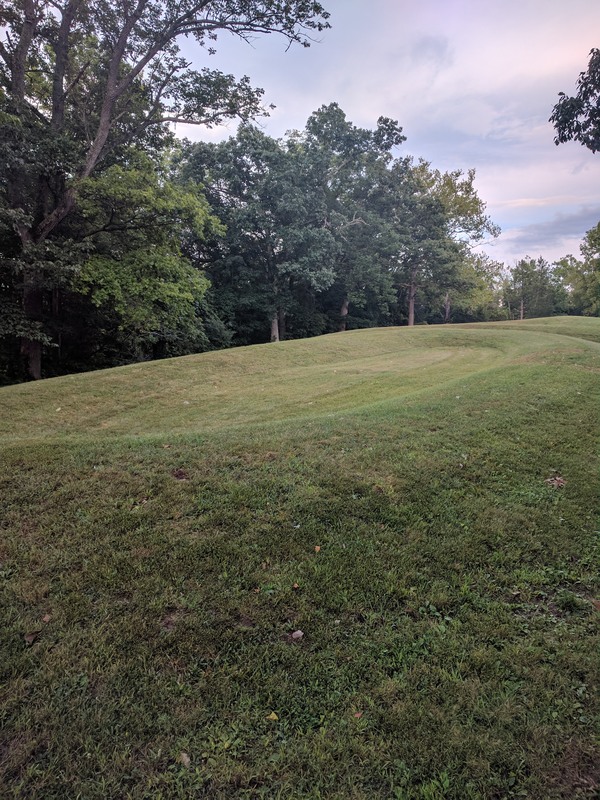 Having been born and raised in Northeastern Ohio, these mounds were well known and were part of standard elementary school curriculum in the region. Fast forward decades later and I had long since moved from Ohio, but the Serpent Mound resurfaced within my consciousness. However at this point I had since studied symbology, numerous esoteric traditions, and most recently had learned how to make use of latent healing and psychic abilities. As such, I was viewing the same thing, but from a different perspective and an expanded consciousness. The Serpent Mound had resurfaced as part of my viewing of the Cosmic Disclosure series on the Gaia network. For those unfamiliar with Cosmic Disclosure, and Gaia in general, both are known for intriguing, yet very unconventional views and topics. 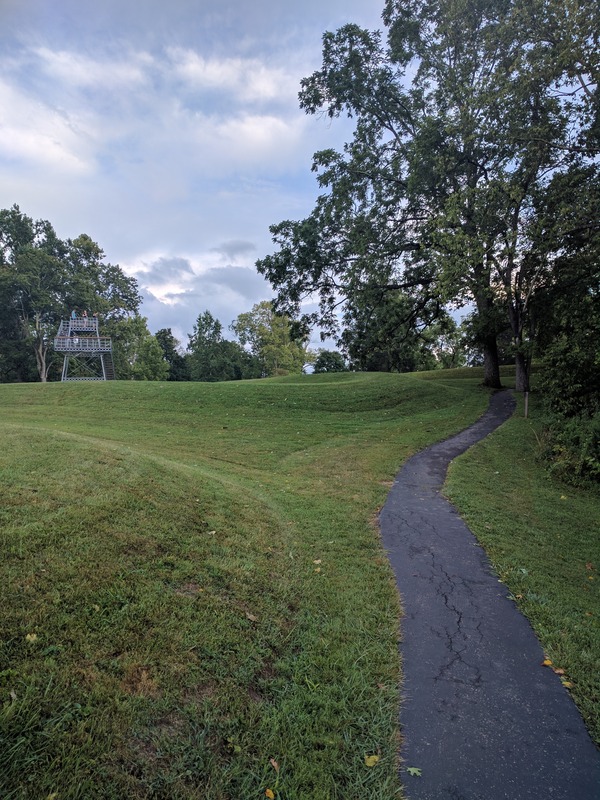 One of the things that struck me about my personal experience with the Serpent Mound is that I arrived at a near perfect viewing time. When arriving at the Serpent Mound it had just rained heavily for several hours, but the rain clouds had subsided and it was about an hour to sunset. The rain had stopped, the sun was shining brilliantly through the clouds, and I pretty much had the location to myself. 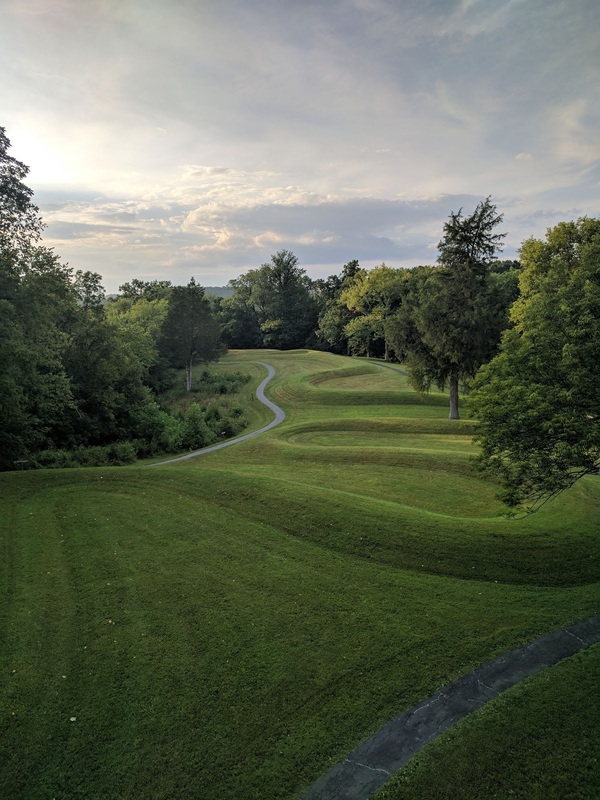 One of North America’s most spectacular effigy mounds, Serpent Mound is a gigantic earthen sculpture representative of a snake. 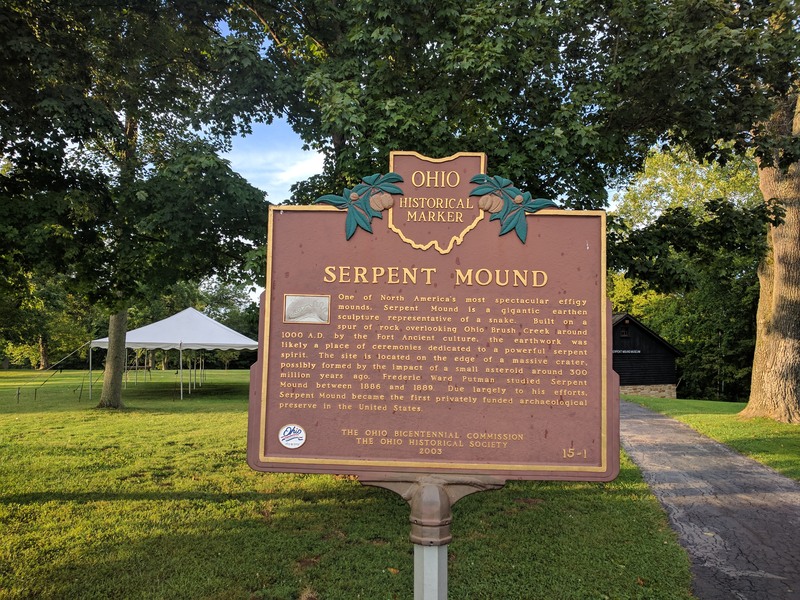 Built on a spur of rock overlooking Ohio Brush Creek around 1000 A.D. by the Fort Ancient culture, the earthwork was likely a place of ceremonies dedicated to a powerful serpent spirit. The site is located on the edge of a massive crater, possibly formed by the impact of a small asteroid around 300 million years ago. Frederic Ward Putman studied Serpent Mound between 1886 and 1889. 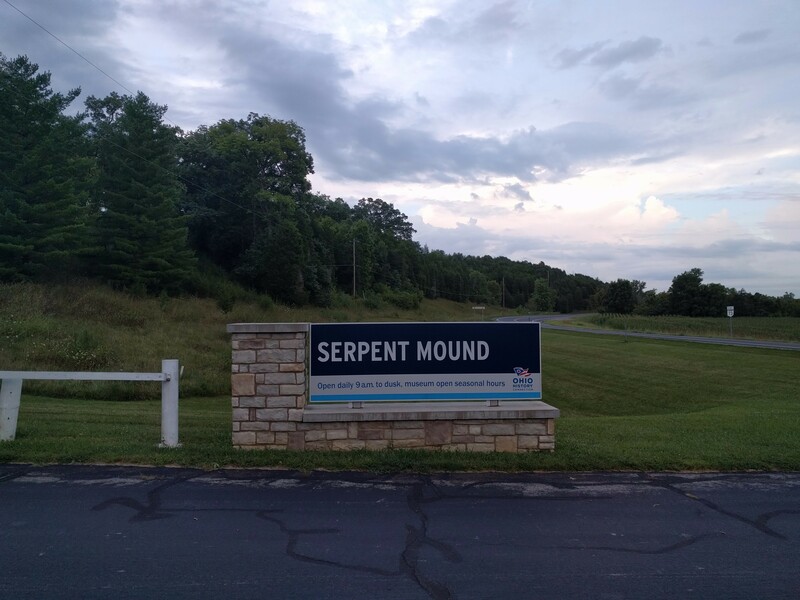 Due largely to his efforts, Serpent Mound became the first privately funded archaeological preserve in the United States. Probably the most intriguing aspects from my view is the idea of an asteroid having impacted the area around 300 million years ago and the decision to fashion the mound after a serpent spirit. The serpent is a symbol linked with wisdom. In addition, I could not help but recall the serpent association within Ancient Egyptian tradition and alchemy – specifically the idea that extraterrestrial beings or “gods” descended in antiquity and gifted the natives with knowledge which drastically advanced their society. 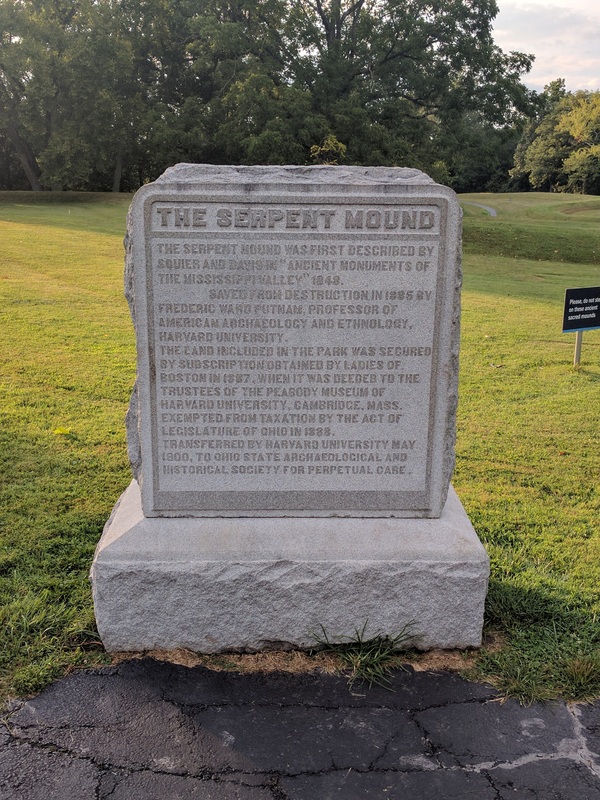 Perhaps on a smaller scale such an event happened in this location as well, and the Serpent Mound was a tribute, or expression of gratitude from the natives to the gods. 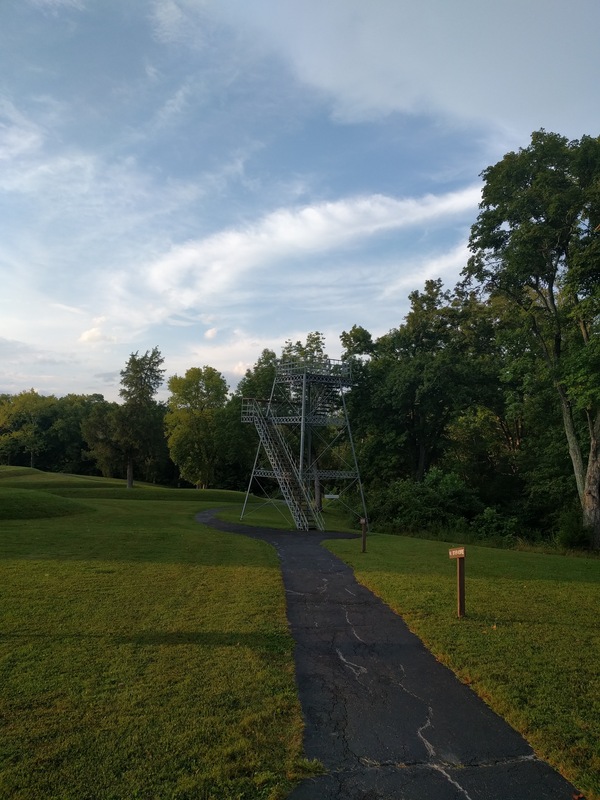 Another interesting aspect of this site is the metal viewing tower that may be climbed to gain a higher vantage point and perspective over the entire Serpent Mound complex. The tower itself was of a metal construction type, however the steps and platforms were laden with wood. 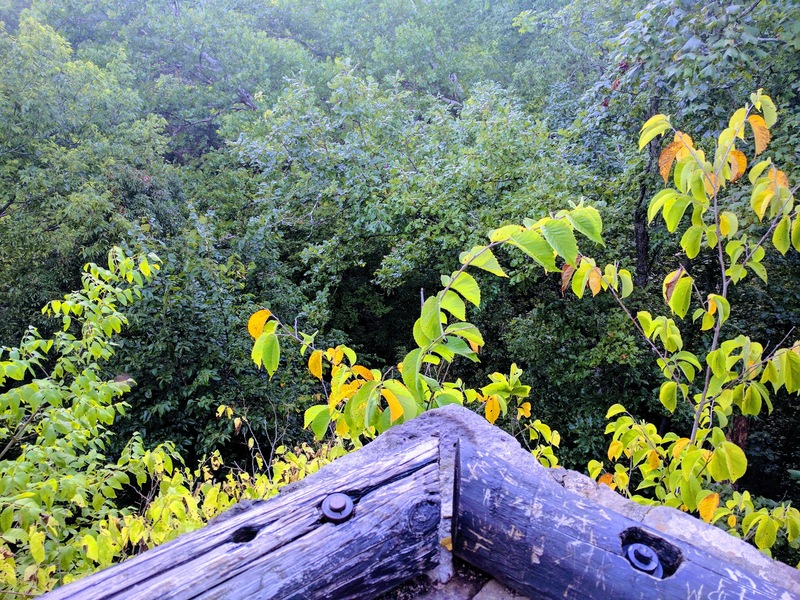 It had recently rained heavily which gave the wood a soft feel, so although I was walking on strong metal, it still had a soft feel which provided a natural, and somewhat unnerving experience as I ascended the tower. I’m not a fan of heights in general, although I was surprised to find myself succumbing to a feeling of vertigo as I ascended the stairs to the top of the tower. Once you reach the top the view is breathtaking. It’s simple, yet magnificent in it’s simplicity. From the top of the tower you can view a definite serpent pattern. It’s interesting to note that while at ground level the pattern is not really observable, but from a heightened vantage point the pattern emerges. This reminded me of other sites around the world constructed by supposed primitive people that are only viewable from a heightened perspective. 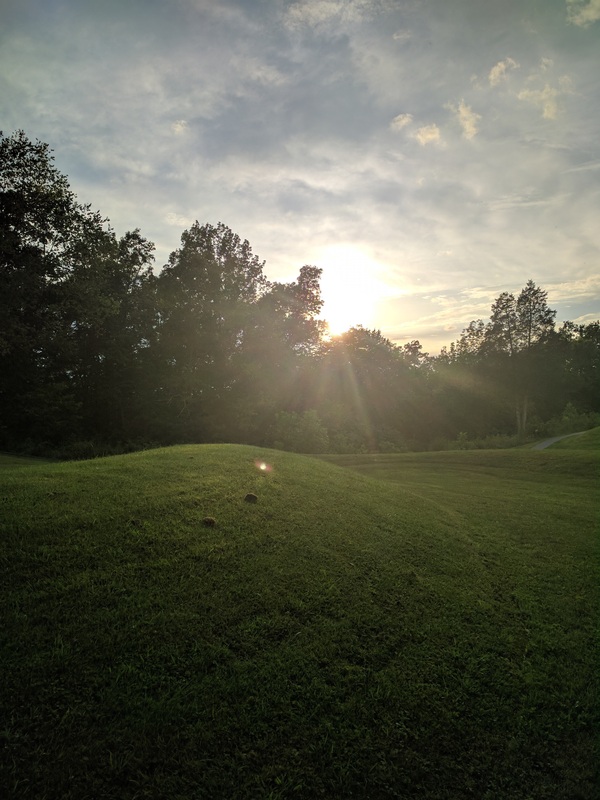 After descending the tower and walking along the trail that parallels the Serpent Mound, I captured the following photo of the sunset. Note the three “clumps” on the mound itself, one of which is illumined by the sunlight. This was not visible while I had taken the photo as I was really just trying to capture the sunset over the Serpent Mound complex. Whether this is something of interest, or just a trick of my Nexus 6P camera I’m not sure, but I found it interesting nonetheless. Yet another interesting item was the markings of the various vantage points around the complex. 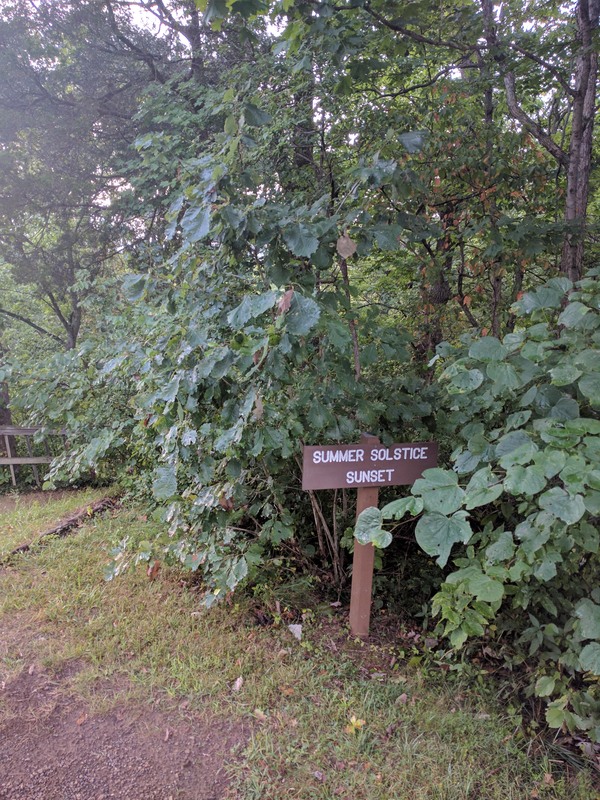 There are signs marking the solstices and types of moon events with arrows pointing to where what I could assume that one could view the event from the proper vantage point. This was something that I was also previously unaware, people obviously come here to view celestial events and alignments. The next images are of an overlook of what I assume to be the asteroid crater over which the Serpent Mound is constructed. It has since filled in with vegetation, but it’s quite a drop down and an impressive view, the beauty of which was difficult to capture in still image due to the heavy foliage. The following image was also of interest in that the serpent head appears to be a raised, oblong oval which encapsulated a central area of flat land. While viewing this I had considered the discussion on the show Cosmic Disclosure where they presented the idea that the Serpent Mound as a hibernation site for advanced extraterrestrial giants. A fantastic idea, but intriguing nonetheless. This is another image of the tower, but from the opposite end of the complex. There are also a couple of visitors on top of the tower which provides a sense of scale of the structure, even though the base of the tower is obscured by the mound itself. Overall the Serpent Mound makes for a fun visit if you find yourself in the area. You likely won’t spend long at the site, maybe an hour or so, unless you make use of the picnic facilities at the site and make an event of it. However, given the picturesque nature and unique energy of the site it’s definitely worth a quick trip!